A Quiet Night Watching The Tonys - or so I thought! A Quiet Night Watching the Tonys – or so I thought….! I was so excited last night to just park myself on the couch with a big bowl of pasta, a martini, and my iPad to watch this year’s Tony Awards. Yeah, I’ve become that person. I can’t just watch a TV show…I have to be connected to the net simultaneously. Gosh I just love Neil Patrick Harris. I think he should host everything from now on! He’s so funny, loose, perfectly self-deprecating….and he sings! I was looking forward to catching up on all the plays I didn’t get to see in person because of a busy pilot season. A good casting director is always doing her homework! Just as I start to get into the show I see a status update on Facebook from a friend saying that her dog is missing. My coaching client’s mother’s dog has gone missing in Texas. 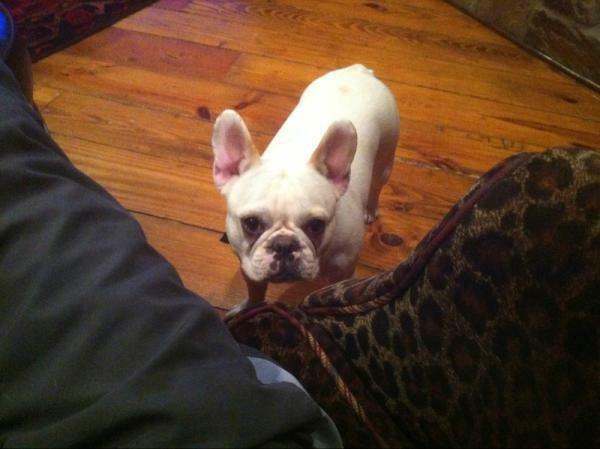 Yeah, a small French Bulldog in the heat of Texas in the Summer. Not good. So what do I do? I take to the Twitter. I start tweeting the crap out of this to everyone I know and asking them to RT (re-tweet) my tweet. I know that I have about 7800 followers, but if I could get them to RT this tweet to all of their followers….well, you get the picture. We could get the word out instantly to TONS of people. I have become a huge fan (read “addict”) of social media in the last few years. I used to think it was just people tweeting about what they ate today or where they are (I still hate Foursquare – why do I need to know where you’ve “checked into” at any given moment of the day?!). I’ve come to realize it’s SO much more. Social media (Facebook, Twitter, blogging) brings us that much closer to each other. It’s not about “me, me, me” in this world anymore. It’s about you and me and how we can help each other. I love how a very large community of strangers becomes a small community of friends, helping each other. By the end of the evening, I had gotten so many people to re-tweet my original tweet about the lost dog. They included people who had only 12 followers (thank you), to people who have 32,360 followers – thank you Lacey Chabert! I was so touched that a big corporation like Back Stage Magazine with 21,535 followers who was very busy tweeting about the Tonys (remember…I was still parked on the couch trying to watch the Tonys) would break away from their job and tweet about a lost dog. Amazing support. By the end of the night, my tweet had been seen by over 100,000 people worldwide! By morning, the dog had been found. Seems that my friend’s family in Texas plastered the city with homemade posters and the dog was found….only a few houses away. Phew! Moral of the story? Yay for social media and yay for good old-fashioned craftiness. One more thing?Please microchip your dogs! Even if they’re an “inside” dog and you think they never want to go outside and leave your side – there’s always a chance that your gardener will leave the gate open or they will somehow get out – and it’s usually without their collar on! Hell, I’d microchip kids if I could!! You might think this was enough for one night, right? I could get back to watching the Tonys and see scenes from the play Once which I really wanted to see in person. But no, that would be too easy. Stay tuned to Part 2 wherein I manage to cast the lead of my friend’s short film….from my bed! I figured I’d just start reading the blog backwards to forward. It is so true about having to be connected to net simultaneously while watching television or while eating breakfast or going to the bathroom. It is intense at times. I am glad that they found their dog. It is a cute one : D.
I signed up for your email list. It looks like you are running it through AWeber?